Who doesn’t love happy hour? The folks at Seattle Center sure do. 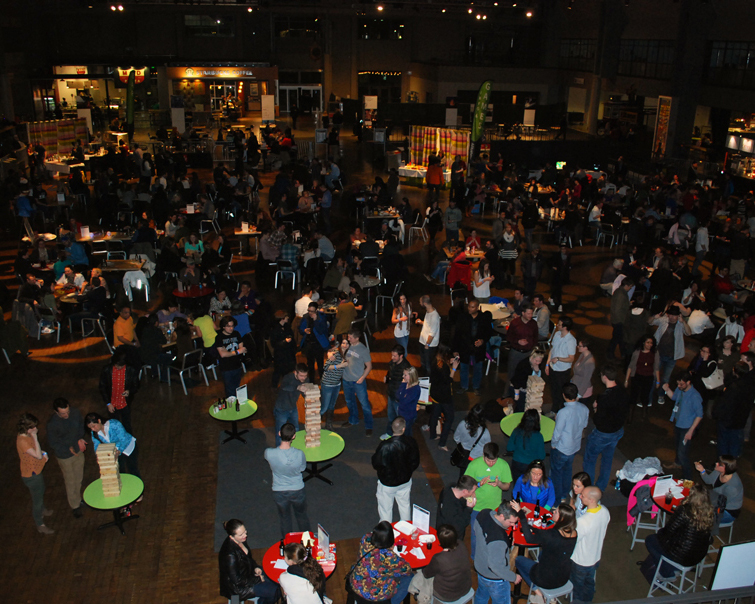 On the third Thursday of every month, Seattle Center hosts the Best Damn Happy Hour in Seattle. While many places serve specialty cocktails, cold brews, fine wine and tasty food during happy hour, that’s just the beginning at Seattle Center. It truly is pretty damn good! The crowd at the Best Damn Happy Hour in Seattle. Time: 5 p.m. – 8 p.m. When you walk into the Armory, you’ll notice the middle of the building fenced off. You show your ID, get a wrist band and enter that fenced off area– which is where the Best Damn Happy Hour in Seattle is happening (think of it as a beer garden). While you are allowed to go in and out of the area as you please, you aren’t allowed take alcohol in and out. This is where things get a little tricky. The bar with the specialty cocktails, beer and wine is located in the happy hour area, but not the food. I recommend grabbing a bite to eat at one of the eateries along the outside wall of the Armory, and then bring your food inside the fenced off area. 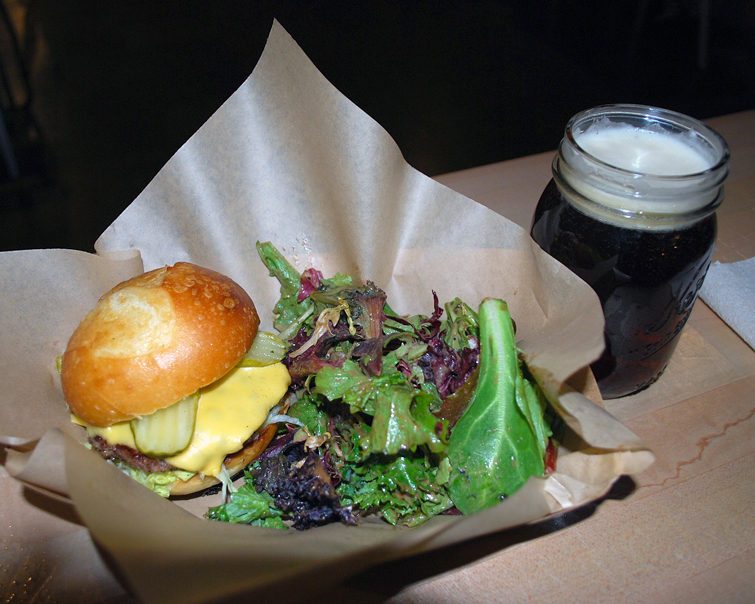 Burger from the Skillet Counter at Seattle Center. Every month, the various restaurants have specials for the Best Damn Happy Hour. They switch it up all the time, and it’s at a great price. I grabbed a burger at the Skillet Counter last time I went, but there were also great options at MOD, Kabab, Blue Water Taco Grill, Bigfoot, Bean Sprouts, The Confectional, Plum Pantry and many more. Once you have your food in hand, head into the blocked off area so you can take part in all the Best Damn Happy Hour fun. There are a couple of different bars set up that sell cocktails, beers, and wine. There is also a table with nearly every board game you can imagine. All the games are free to “rent” for the evening. There are also super-sized Jenga and checkers games, and a section of tables with old-school video games. 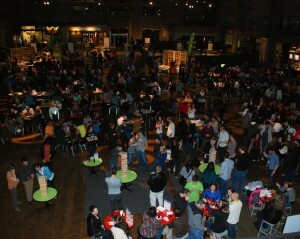 The place is packed with people playing games and having a great time. And again, it’s all free! 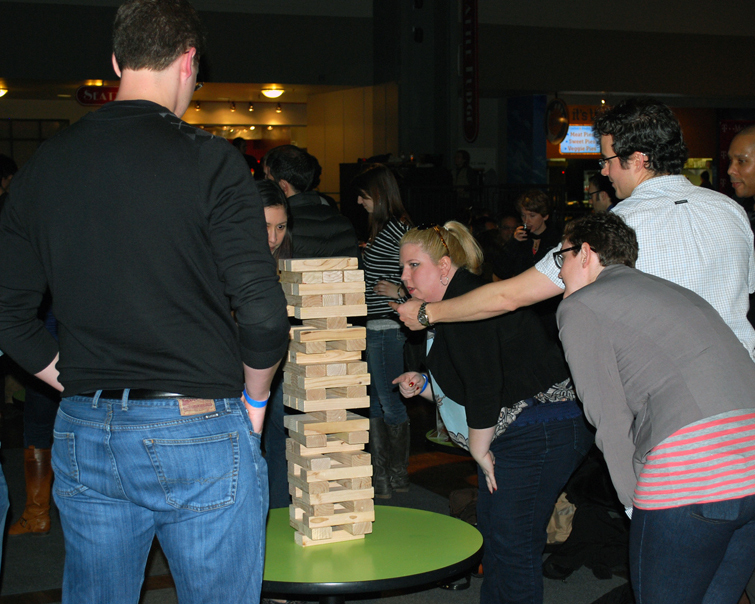 People love the super-sized games at the Best Damn Happy Hour in Seattle. On top of the food, drink and games at the Best Damn Happy Hour, there’s also music and drawings throughout the evening– which really gives you another reason to arrive early and stay late. And we’re talking some great drawing prizes. Last time I was there, they gave away tickets to concerts and shows at Seattle Center. Every month at the Best Damn Happy Hour in Seattle is different. There’s a different menu, new cocktail or beer selection, special game or fun entertainment. I recommend checking out the Seattle Center’s website before you go (hopefully each month) to get the latest scoop. Have you ever checked out the Best Damn Happy Hour in Seattle? What did you think? We’d love to hear from you. Drop us a line in the comment section below or connect with us on Twitter, Google+ and Facebook. You can also check out Seattle Bloggers for more rad things to do in Seattle! This sounds like a blast 🙂 My fiancé and I are both relatively new to Seattle so we’re always looking for fun things like this to partake in! Right on! Welcome to Seattle. Let us know if you’re looking for any other fun ideas!